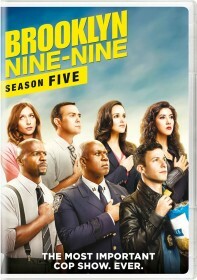 FOX has issued the press release for the November 7 episode of Brooklyn Nine-Nine, "The Venue". Dean Winters (Law & Order: Special Victims Unit) reprises his role as as the Vulture. The always unwelcome Vulture pops back into Jake and Amy's lives, threatening to swoop in and take something important away from them. Meanwhile, Boyle and Rosa must track down "Sergeant Peanut Butter," the kidnapped NYPD horse that Charles envies, and Holt challenges Terry to be less image-conscious in the all-new "The Venue" episode of BROOKLYN NINE-NINE airing Tuesday, Nov. 7 (9:30-10:00 PM ET/PT) on FOX.